We will be using the same recipe we used to make the famous French “Filet Mignon Au Poivre”. 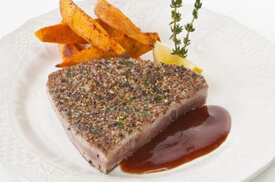 The great thing about fresh tuna is that it can be treated just like a steak. It’s cooked at the same temperature and uses the same sauce as well. This class also features a recipe for Tomato Soup with Sweet Corn!